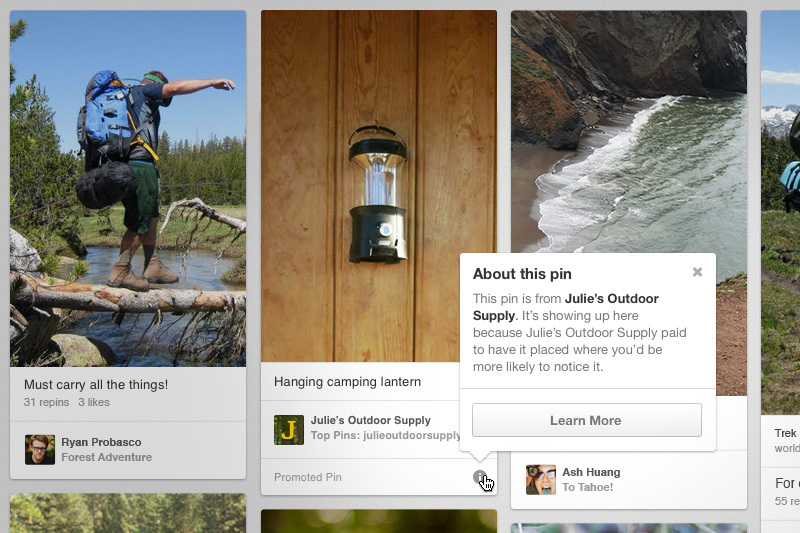 Pinterest Starts Testing Promoted Pins | TrueLogic Online Solutions, Inc. Promoted pins are now visible in Pinterest search results and category feeds. They look and work just like regular pins, only with a “Promoted Pin” label and an icon that explains why the pin is there and which website it’s promoting. This new feature is still in the test phase, with only a few promoted pins from “a select group of businesses” appearing for now. A recent study by eMarketer reveals that about 25% of US agency executives show interest in using Pinterest for social campaigns, which makes this move toward paid advertising unsurprising. Many users also began expecting ads to appear in Pinterest after the implementation of the “Picked for You” feature last month. This involved displaying recommended pins (labeled as “We thought you might like this”) based on a user’s existing boards. Pinterest clarified that these are different from promoted pins, as “We thought you might like this” pins only appear in users’ home feeds, not in results or category pages. The announcement was met with mixed reactions, with some users citing how much they hate the “We thought you might like this” pins and expressing how they expect promoted pins to be no different. We keep ourselves updated on the latest news in social media marketing and advertising to offer clients effective digital marketing services. Keep checking our blog or talk to us to know the current trends in online marketing and social media.